Measure S proponents from embattled communities argue that while development in our fair city tends to be driven by deep-pocketed interests, it is lower-income communities, particularly disenfranchised communities of color, who essentially end up footing the bill. At best, they argue, they are considered as an afterthought in planning; at worst, they have their homes yanked out from under them and/or are lied to, harassed, intimidated, and policed out of their neighborhoods as developers work to pave the way for a shinier, wealthier future. Segregation and exclusion are inextricably intertwined with planning’s history. They are embedded within its structures, policies, frameworks, narratives, objectives, and power dynamics. And the fact that there is so little representation of voices of color or others from the margins within planning and development even now means that many of those demons have yet to be fully excised. Or even acknowledged, for that matter. But, as best I can tell, giving developers the finger by voting “yes” on Measure S would not only do nothing to change this situation, it might serve to make it worse. Which is not to say a “yes” vote isn’t tempting. When I think back to how last August’s city planning commission (CPC) hearing on the billion-dollar Reef project played out, it’s clear why people want to stick it to developers. I could practically hear stakeholders’ eyeballs rolling back into their heads as Mayer Brown LLP attorney Edgar Khalatian spun tales of developer Ara Tavitian’s commitment to the South Central community, painted him as heroic for investing south of the 10 freeway, argued it was better for the community for The Reef to seek a zone change and dump funds into the Affordable Housing Trust Fund (AHTF) (instead of integrating on-site affordable units into the project), ran circles around questions from planning commissioners, and openly dismissed residents’ concerns about indirect displacement. For its part, the CPC seemed limited to expressing annoyance at the developer for ignoring three years’ worth of recommendations that the 1,444-unit luxury residential and 208-room hotel project slated for 1933 S. Broadway include on-site affordable housing and reduce its asks regarding supergraphics and digital signage. The developer’s last-minute offer to throw three million more dollars into the AHTF pot only appeared to add to the commissioners’ sense that the project favored segregation to integration and engagement with the surrounding community. Which it might not be. But when the cards are stacked in your favor, it doesn’t need to be good. You just need to know that you have the preponderance of power. Which Khalatian and Tavitian did. And they acted accordingly. The preponderance of power granted to developers is what leaves so many inclined to think, “Yes! That’s exactly why we need Measure S! To curb the ability of developers to throw their weight around and get whatever General Plan amendments they want for at least for two years! To permanently ban such projects on lots smaller than 15 acres [a.k.a. most projects]! And to keep developers honest by prohibiting them from using their own consultants to produce studies that show only negligible impacts to traffic or the environment!” To folks fearing the demolition of their rent-controlled apartments or a mega-project-induced gold rush in their community, few things would be more satisfying than saying “no” to a developer who has zero stake in the neighborhood. Like so many good things, however, giving developers the finger comes at a steep cost. And also like far too many good things in our fair city, the brunt of that cost is much more likely to fall on the shoulders of our poorest and most vulnerable communities. For one, S has no capacity to stop people from moving to Los Angeles. And therein lies its most basic rub. We’re already behind in housing production, and especially affordable housing production – projects which also rely on General Plan amendments and which would also be held up, including those that are 100 percent affordable. [See a list of such projects here.] The scarcity of all levels of housing is one of the main reasons why rents are so high in the first place. That’s just math. Slowing housing growth would only turn up the pressure on communities where unscrupulous landlords are already intimidating tenants into leaving “voluntarily” and where house flipping has already gained some traction. I would never argue against greater flexibility and transparency in planning. But I would argue none of these things will address the structural injustices embedded in the planning process or the unsettling lack of voice communities of color and others on the margins currently have in it. Let’s return to The Reef project for a moment to get a sense of why this matters. It was frankly stunning to hear the planning commission stumbling over itself while deciding which income level to set for the on-site affordable units, for example. At one point, commissioners floated both “workforce” and “moderate” income-level housing. This, despite “moderate”-level income being defined as $77, 750 for a family of four (120 percent Area Median Income or AMI) and “workforce” being set even higher, at 150 percent AMI. 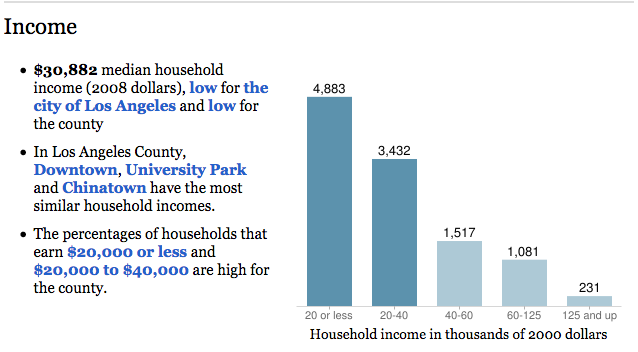 Both are well above L.A.’s own AMI, defined as $64,800 for a family of four (see second chart, below). Also of note was how heavily the commissioners relied on the Housing and Community Investment Department (HCIDLA) to get a sense of how far funds set aside for the AHTF would stretch in safeguarding existing affordability covenants, acquiring existing units, or building new units. While Helmi Hisserich, Assistant General Manager of Housing Development, was forthcoming in acknowledging that there were far fewer covenants in real danger of being lost than Khalatian and Ninth District Councilmember Curren Price had originally alleged, she was much less so in discussing the significant challenges HCIDLA has had in seeing those covenants extended for more than a few years at a time, especially in a booming market (like the one the passage of Measure S likely would fuel). Finally, completely absent from the commissioners’ deliberations was the fact that affordable housing is often inaccessible to those who are most vulnerable to displacement. The tools we have to create and preserve affordable housing (including density bonuses) tend to target higher low-income brackets – those people earning between 30 and 80 percent of AMI. And on the rare occasion funding is available to target even lower-income levels, the minimum income required to qualify for those units – generally three times the proposed rent – can still leave many extremely low-income folks out in the cold. For those living with extended family or who are in multi-generational situation, family size allowances can also act as a barrier. Larger apartments at lower income levels can be scarce, meaning accessing housing might mean families have to shed a relative or two to qualify. There is, of course, so much more that was missed during the hearing. Push factors for displacement come in a variety of forms, many of which are indirect and none of which are well-captured by any of our current assessment tools (or even allowed, in the case of CEQA). It’s hard to track the extent to which the loss of local businesses (corner markets, clinics, etc.) or the disruption of social networks (neighbors that helped out in times of need) can eat into residents’ very tight food, health, or transportation budgets and make it tougher for them to make rent every month, for example. Or the role increased policing plays in erasing a community from the visual, cultural, and ultimately physical landscape. But one has to first be aware these sources of vulnerability even exist before they can brought into planning discussions and addressed in a meaningful way. And too many within planning lack a visceral understanding of the damage done by decades of disinvestment, disenfranchisement, and denial of opportunity or how it has left some communities so uniquely vulnerable. Measure S neither addresses a single one of these sources of vulnerability nor does it seek to close the gaps in our capacity to identify and address them. Instead, passage of the measure would–much as it has done in the lead-up to the March 7 election–keep planners, advocates, and elected officials distracted with narrow and heated debates about transparency, traffic volumes, blocked views, spot zoning, whether or not Leonardo diCaprio was ever on board with the measure, shady tactics used by the Yes on S campaign, and how much housing would or would not be blocked by the measure. With each passing day, it feels like there is less and less space for dialogue on what it means to forge a truly inclusive planning process, and less and less room for discussion of how, where, and in what form we can encourage housing growth so as to do minimal harm in constructing a truly inclusive city. As Eighth District Councilmember Marqueece Harris-Dawson suggested in both a Sentinel article and at a press conference in South L.A. last week, the measure doesn’t even allow for the most basic of conversations around the specific needs of communities like South L.A.
“This Measure was conceived at the top of a tall building in Hollywood,” he said, referring to the origins of the measure in AIDS Healthcare Foundation CEO Michael Weinstein’s selfish desire to protect his unobstructed view of the Hollywood sign. And while there were very real displacement issues to consider in Hollywood, given the boom the neighborhood had experienced, Harris-Dawson continued, it made no sense to apply the same solution in South L.A., where for so many years, it was a colossal struggle to get an investor to even blink in the community’s direction. “I don’t think…that when [the measure’s sponsors] were writing Measure S they traveled south of the 10 freeway,” he said. “They didn’t see that we still have a lot of vacant lots in our community. Big giant vacant lots! We still have far too many people who work in this community who cannot afford an apartment or a place to live. Much less one that you can buy. We need housing. We need commercial development.” Not limits on the community’s ability to build affordable housing, address homelessness, or just grow, period. Given the origins of the measure, that seems highly unlikely, to be honest. But the fact remains that they didn’t make that effort. Trapped in other people’s debates. Unable to address the really urgent questions we should be addressing about how we are growing as a city. And forced to take a developer-friendly position just to maintain a deeply imperfect status quo. See you at the polls on March 7th! Literally all of the organizations whose mission is helping to build, provide, maintain, etc., affordable and low-income housing are opposed to Measure S because it makes their missions more difficult. There are very smart and hard-working people running these organizations, and I think we can assume they have weighed the pros and cons and all come to the same conclusions about what the effects of Measure S would be for good reason. They probably keep their neighborhoods looking run down and crappy and drive old cars that are falling apart too, in order to keep people from suspecting their lucrative tax-avoidance schemes. And they would have gotten away with it too, if it weren’t for Scooby Matt and those meddling kids! It’s even worse than you think – if you look at the entire text of Measure S, there is a provision that vastly expands the grounds upon which a citizen can sue a developer and/or city officials over a project they don’t like. It’s set up to be a giant boondoggle for money-grubbing NIMBY plaintiffs attorneys like Silverstein (who doesn’t even live in LA – he’s out there in Pasadena). I think the LATU is angry at displacement, which is a valid concern, but haven’t read and/or understood the actual text of Measure S (versus the misleading rhetoric coming from its supporters). Anyone who reads the actual measure knows it does nothing at all to prevent displacement. The drafters of S could have easily made it an anti-displacement measure, but that was never their goal or concern. They just don’t like new development, even if it’s on a parking lot that currently houses nobody. Measure S even includes a provision that makes it more difficult to lessen/eliminate parking requirements for projects, even when it would make sense given the location. It’s insane. Regarding your last paragraph. I’m saying both of those things, and don’t find them contradictory. The Reef, much like USC’s expansion, will indirectly displace folks by making the area more “attractive.” It’s already happening around nearby Trinity Park, where newcomers are moving in, much to the surprise of long-time residents. But not allowing for such projects puts pressure on communities that are already seeing quiet turnover, like Boyle Heights, where folks with little power and resources (and often lacking papers) are being harassed by landlords until they finally leave so the place can be renovated and rented (or sold outright) to a higher-income client. It’s a kind of damned if you do, damned if you don’t catch-22 for folks who fear gentrification, and why so many are on the fence about the measure. Either way, those folks will continue to lose unless we start taking a real look at where we’re putting housing and in what form. Measure S doesn’t help us have those kinds of conversations, unfortunately. Not true. The L.A. Tenants Union is supporting the measure, last I heard, as is Elena Popp, who founded the Eviction Defense Network and has been a huge advocate for tenants in L.A. for decades. Seems like it does try to be a good start to those conversations, by banning market rate and exempting affordable housing, and by prioritizing community planning as against developer-funded and really bribed spot zoning. Neither of those organizations help build, provide, or maintain housing. They advocate for people in existing housing. Measure S says nothing about evictions. But it will cause prices to go up, meaning everyone not currently in a rent controlled unit will be much worse off in trying to find housing they can afford within Los Angeles. Those orgs do “maintain” affordable housing. The argument about supply and rent increases is a good one but it’s not a fact and Sahra’s article convincingly makes the argument that even in the absence of direct displacement, mega projects like those banned by the initiative cam reduce affordable housing by indirectly displacing people. But I don’t think that the Measure S funders have any interest in supporting those conversations. They only support them now because it gives them a greater support base. Right now, it is funding from Measure S that is helping folks like Damien Goodmon get their message out. Once March 7 comes and goes, so will goeth that funding and that momentum. And, as I said, without some of the larger housing developments being built in the meanwhile, the losers will be the vulnerable communities with good bone structures in the long run. I’m as disgusted by what developers are able to do as anybody…no question there. But they’re just one part of the problem. A really powerful part, but only one part of a larger system that disadvantages vulnerable communities and discounts the impact of past discriminatory policies on those communities… Including the impact of Measure S’ wealthier supporters who have used zoning to their advantage to keep folks of color out of their communities [and whose advantages would be frozen in place if it passed]. In all honesty, I find some of the most troubling barriers to be progressive urbanists who are determined to remake the city in their own image and who balk at the first voice of color that pipes up to ask about impacts. If I get excoriated and dismissed outright every time I even raise questions about displacement, there is no reason to think that these conversations are going to get easier just because we have a two-year window on some developments. If working on these issues over the past several years has taught me anything, it is that these wider-ranging conversations will only get harder. At present, I am told poor people have no claim to place and that it is anti-development to ask questions because “housing crisis” and “supply and demand, duh.” Limiting larger housing developments puts majority-renter communities at risk for greater turnover while also making it both harder to track and harder to rally a larger group to have a conversation around. Which means that voices will only be further silenced in the name of the intensified housing crisis. As I say, vulnerable folks lose either way. But I think they lose more and the wealthier gain more with S.
They don’t maintain it. They don’t keep it fixed up. They merely support people who want to continue occupying the same space. That’s a pretty big difference when what we’re really talking about is development and displacement, and Measure S says nothing about Ellis Act evictions, the preservation of affordable housing, etc. As many others have pointed out, blocking large developments makes developers more likely to target “by right” projects, which frequently take the form of knocking down existing affordable housing (and Ellis Act evicting the tenants) to re-build as luxury town homes or mega mansions. At the end of the day, the arguments FOR Measure S are weak or speculative at best. I agree with you on a lot, pdan, but I’d be careful with the LAO report in that it is a market-based approach to housing and doesn’t really address the fact that trickle-down housing is not really a thing. Or it’s an incredibly long-game thing…like decades long. Or the question of indirect displacement. You’re right that supply matters, and I argue that as well. But I would argue that where the supply goes and who it serves also matters… and that’s a slightly different take. Measure S is still problematic within that frame, but it recognizes that the way we do favor developers in the guise of safeguarding markets is problematic too. As you state in a different comment above, vulnerable folks lose either way. The vulnerability comes from two places: economic (lack of ownership – you have a choice not to “sell out” if you own something), and the lack of a voice/seat at the table in terms of decision making and resource allocation, and that is a combination of racism and economic disparity. I think it’s fair to say that progressive urbanists are focused more on looking at things through the lens of economy (greater supply = lower prices), as well as functionality (density + transit = ease of mobility and more efficient use of resources), but likely ignore or discount the racist/cultural side of things because that is a much larger and more complicated societal and structural problem than urban planning alone can solve, or perhaps even address. This is a long way of saying that I recognize and acknowledge the issue, but I frankly don’t have an answer for indirect displacement. At least we both agree Measure S is not it. I really appreciate your honesty and the depth of thought that you’ve obviously put into this. I’m not sure how I would vote if I were in L.A. I would probably have to do a lot more research. I know that the planning process there is out of control and has been for a very long time. I think you astutely put it above that the status quo is horrible, but this could be worse. But I think a good argument can be made that if the status is horrible, and moratorium on anything happen pursuant to it is a very good and necessary first step toward fixing it. In my opinion, ultimately it is all about getting community plans into place and then making everyone stick to it. There are huge “envelopes” for new development “by right”, they just aren’t in the places that market rate developers want to build. And affordable housing is not limited by zoning, but by funding. But I do also accept the basic argument that more density equals more affordability, and that’s what planning battles are generally all about. So I dunno but good luck on Tuesday! Is Los Angeles Ready for 30/10? The report is much more than just a discussion of the region's active transportation needs. It's a call to arms - a plea to the Southeast cities to take a leadership role in investing local return dollars from Measure M in infrastructure that serves the area's most vulnerable road users.